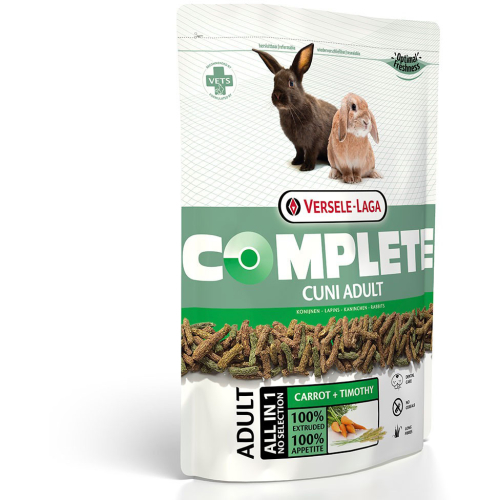 Versele-Laga Cuni Complete Rabbit is an extruded food for rabbits, with long, unground fibres, high-fibre content, low starch content and no cereal grains! This balanced food has been specially created to fit the needs of rabbits. Each piece of Cuni Complete contains the same blend of ingredients ensuring selective feeing is impossible. •	The long fibres with a high silicate proportion promote maximum chewing activity and natural abrasion of teeth. •	Versele-Laga Cuni Complete contains at least 10% fresh vegetables making this food delicious and a great provision of nutrients. •	The low energy and startch content with high long fibre content ensures an easily digestible and balanced diet. Therefore your rabbit will continue to keep to its ideal weight. •	The addition of natural plant pigments, lutein and β-carotene help to promote a strong immune system. •	Rich in Omega 3 & 6 fatty acids helping to maintain healthy skin and a shiny coat.